You just know when something belongs to the exceptional category. The guitar scalds my skin. The harsh drumming bruises me. Allt är Åter ominously unravels, slowly and proudly, giving me a sense of stoicism borne out of trial and tragedy: to be at the mercy of Nature is as frightening as awe-inspiring. Askormen: doomingly deranged, stabbed by grimly frightening blasts, its ghoulish melody stirs deep into the guts with snake-like regurgitations from that astounding bass; ominous spells spew from the mouth of the cursed… then a sudden (genius) solitary clean verse thrown in towards the end displaces me completely. Masterpiece. Tidlösa Vindar, gloriously juxtaposing acoustic depth to scalding blasts, takes you close to what it must be like to stand in the midst of a spectral storm - take these words literally. As the ominous spell descends upon me, the room transforms into an intricate white icy forest. I am beginning to wonder if this is actually real… A lesson on how to do powerful shuddersome epicness without a mere hint of redundancy! Grim despondency, realism and sobriety, as opposed to suicidal whining, provide a tremendous shot of testosterone, a rare thing in much of today’s weakling/fake (delete as appropriate) black metal. My early impressions are fully confirmed: this is a work of rare force, integrity and intellectual honesty and intelligence. One of the best black metal albums I have come across in recent times, one which refuses to play the trump cards of extreme lo-fi and overwhelming, decadent drama, choosing instead the higher path of balancing bleak despondency with stark sobriety. It reflects a smart, down-to-earth vikingness that rejects the lure of tempestuously romantic Wagnerian scenarios, digging deep in the face of a harsh environment, always a metaphor for death and the void beyond it. 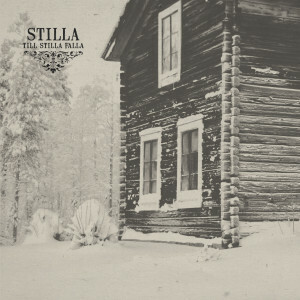 In spite of its unsettling ghostly eeriness, what captivates me about Stilla’s sound is a fierce sense of resolve and practical creativity stemming implicitly and inevitably from the constant fight against the elements, always on the edge of madness, always on the edge of survival... Ultimately the Swedes, throughout this bleak, honest, old-school approach imbued with an unmistakable avant feeling that pushes the work above the rest, stare at the ineluctable with a level of self-respect that, lamentably, is rarely encountered. Till Stilla Falla will keep growing in time, eventually taking its full form when the lyrics will hopefully come forth to me: I am convinced it will be one of the few recent albums I shall go back to whenever I need to restore my faith in music! Stilla are: Pär Stille (Bergraven) on guitar, Andreas “Vidhall” Johansson (Deranged) on bass, Andreas Pettersson (De Arma, Armagedda, Lönndom, Whirling ) on vox/keyboards and Johan Marklund (De Arma, Sorgeldom, Whirling) on drums.